I understand the modern reluctance to subscribe to a bit of dead tree that is thrown onto your front step so you can read about what happened yesterday… or last week. But Trump’s continued tweets about the “Failing NY Times” and “Fake News” made me start paying attention to the Times and to the Washington Post. And what I’ve found has impressed me. When we all thought that Trump would lose the presidency – including Trump himself – Trump was busy preparing his excuses, which included accusations of election fraud (he never talks about that now) and accusations of biased media and “fake news”. This is unsurprising since Trump is incapable of taking blame for his failings. But when Trump won, America’s astonishment seems to have resulted in a dramatic increase in the circulation of the New York Times. The Times annual report for the fiscal year ending in December 2016 showed a circulation of just over 570 thousand daily subscribers, and just over a million Sunday subscribers. But that report also showed a “bump” of subscribers in November and December. Now we know it’s more than a bump. As of early February, subscriptions to the NY Times have increased to over 3 million, with most new subscriptions from digital subscribers. And it’s not just the NY Times, the Washington Post has also seen a dramatic increase in subscriptions. And why not? The Times and the Post have been doing some excellent reporting lately. So much so that the first two people that Trump called about the cancellation of TrumpCare were Robert Costa of the Washington Post and Maggie Haberman of the New York Times. Even Trump knows how good these news outlets are. Don’t look at his words, look at his actions. He didn’t give his scoop to the New York Post or to Breitbart. He knew he would be reported fairly by the Post and the Times. And he was reported fairly. Okay, so the New York Times has news. Are there any other reasons why you should subscribe? The New York Times has done an excellent job at making their archives available to digital subscribers. As someone who uses newspaper archives for research, I can tell you just how difficult this is. Before the 1980’s newspapers archived using Microfiche. Microfiche is just photos of the newspaper pages, and cannot be easily searched by computers. But the NY Times has done it. Digital Subscribers can do complex searches of their archives all the way back to the very first page printed on September 18, 1851. How about price? There is a sale on all-access digital subscriptions going on right now. For $7.52 every 4 weeks you get complete digital access. If you want perks, consider spending $20 every 4 weeks to subscribe to the NY Times AND to Spotify, the streaming music service. If I were not already subscribed to Slacker, I would have done this myself. Trump has been good for the media. 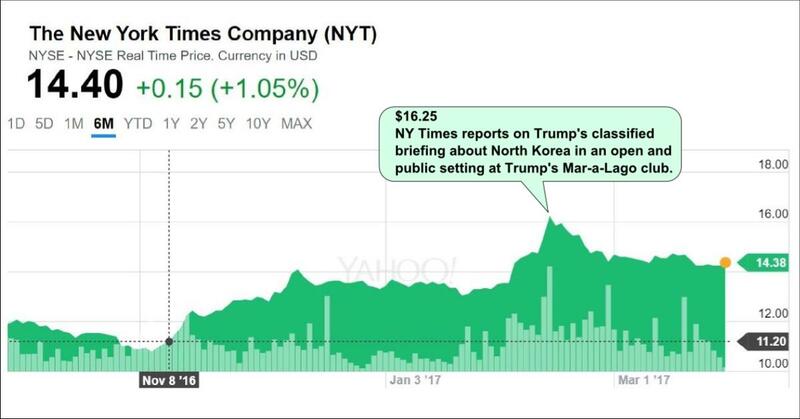 Every time he says that the NY Times is “failing”, their subscriptions increase. It’s the “banned in Boston” phenomenon familiar to anyone who has studied history and who knows anything about the old Comstock laws. And this lack of awareness is one of the reasons why Trump is flailing and failing so badly. ← Previous Previous post: Trump “Care” Blocked!